Guatemala City (Agenzia Fides) - "Faced with the painful loss of life, the many injured and the thousands of people affected by the recent eruption of the Volcano of Fire, in Escuintla and other departments, we express our feelings of closeness and solidarity, illuminated by faith in the God of Jesus Christ: God of life and not of God death, peace and not destruction, always ready to help his children through the commitment of believers in the Gospel of Life": this is the statement sent to Agenzia Fides by the Diocese of Escuintla, for the catastrophe caused by the eruption of the volcano of Fire in different departments of Guatemala (see Fides 04/06/2018), which so far has caused 69 deaths, at least 46 injured, 3,271 displaced persons and 1 million and 700 thousand affected. 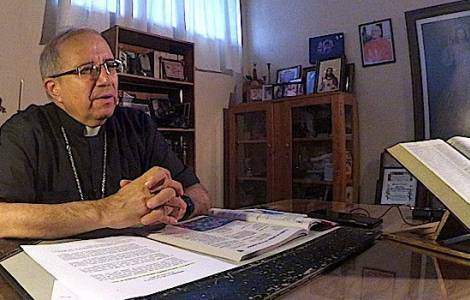 In the message, the Bishop of Escuintla, Mgr. Víctor Hugo Palma Paul, says that the region affected in his diocese "is an area densely populated by farmers and owners of small plots of land, such as producers of coffee, vegetables and fruit". Population density has been a factor that has increased the tragedy of the catastrophe, because "many of the inhabitants were physically isolated from any form of support". "Help the many thousands of people affected in Escuintla, Chimaltenango and Sacatepequez!". The Social Pastoral Care and the diocesan Caritas "have initiated spontaneous and organized interventions, because the emergency due to the loss of land and houses will last for a very long time", explains the Bishop. Among the actions undertaken, three reception centers have been set up in the parishes for those who have lost their homes and property, one of the centers is the diocesan cathedral itself. Furthermore, collection centers have been opened for medicines, clothing and food products and, above all, drinking water. The Bishop asked for a special collection to be held on Sunday 10 June in all the parishes of the diocese, and to celebrate holy masses for the victims and other people affected by the tragedy. Solidarity towards Guatemala was also expressed by the Church of other Latin American countries. 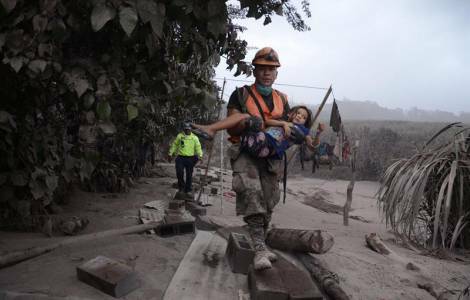 The Permanent Committee of the Bishops' Conference of Panama issued a statement assuring "closeness" to the Church and the people of Guatemala for the suffering and pain caused by the loss of life of their families, the injured and those affected by the eruption of the volcano". It ensures prayers "for those who have died, so that they may find eternal rest; and for their relatives, who can find the peace and consolation that only God can give". In addition to "solidarity towards those who are injured and materially affected", the Panamanian Bishops ask God for his intercession for the Guatemalans "so they can find the strength to start again".